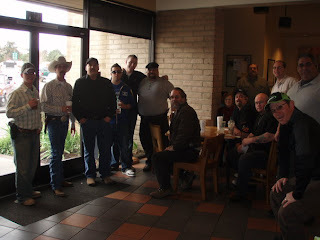 The men with cowboy hats and guns on their hips are not in a bar in Texas, but in a Starbucks in Pinole, California, 22 miles from San Francisco. They are members of East Bay Open Carry, one of a number of intertwined grassroots groups which have popped up in California to promote the currently existing right of citizens to carry unloaded firearms in public. Unlike previous iterations of America's long standing fight over guns - think Bowling for Columbine meets Charleston Heston's "cold, dead hands" - this one is particularly urban. It is not about owning guns or shooting guns, but about carrying them where everyone can see them. And about getting together with your fellow advocates to make a political point in a public - often at a Starbucks, that potent symbol of blue state urbanism reconstituted for suburban consumption. While their agenda spans gun-related issues across the board, their "movement" comes at the time when the US Supreme court has been actively striking down city-sponsored laws aimed at curbing handgun use in cities - first Washington, D.C, and more recently, Chicago. At a time when cities like my Oakland struggle with an epidemic of gun violence, their argument is that carrying guns out in public helps deter violence. The sad irony is that the Open Carry movement was born in the wake of a 1967 reform of the California gun laws which outlawed the carrying of loaded weapons in public, but left the door open for the carrying unloaded weapons. 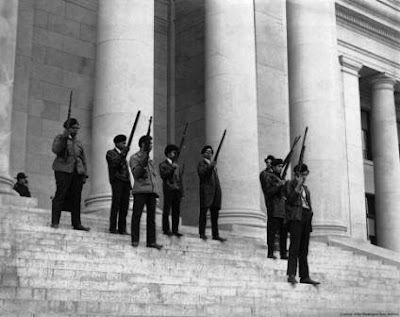 The reform came not at the urging of the anti-gun lobby, but from the pen of then-Governor Ronald Reagan, in response to the armed march on Sacramento by the Black Panthers. The Panthers had armed themselves in response to violence in Oakland - at the hands of the Oakland Police. Joe Bageant, who grew up in the West Virginia hills where one would expect pro-gun politics, argues that we need to leave folks their guns so we can focus on more important issues like healthcare and social justice. Even though the logic seems a good one, it becomes hard to implement when you sense that the guy next to you in line at the Starbucks with a holstered Glock might also think your president is not an American, national health care is a conspiracy, and Arizona is a model of democracy. Credits: Photo of men with guns from the East Bay Open Carry page on Facebook. Photo of the Black Panthers from Marginal Revolution. Photo of the East Contra Costa Tea Party sign by Alex Schafran. I think one of the negative consequences of more advanced technology and increased communication capacity is a stronger polarization of political extremes. The mass majority of people are only exposed to a quick surface treatment of complex issues, and what may in reality be a wide spectrum of perceptions and views are largely grouped into two "ready-made" political outlets of right or left. I'm certainly disturbed by the ongoing gun culture and immature insistence on carrying guns anywhere and everywhere, however it recalls for me the broader issues of urban security and power relations. Stephen Graham has a new book that talks about political violence in cities and sees militaries and police forces blending and in some cases trading roles in an urban environment. The fact that an open carrier also doesn't like Obama or is a consipiritist or anything else listed does not have a thing to do with open carry. Whoever he is feels strongly about his perceptions of how the government is being run, that is it no more no less. I almost never open carry for the simple fact that I live sand-witched between 2 schools and have a very narrow strip of ground I can cover near my house without breaking the current open carry laws. I don't know why you feel yet another gun control law will help California we already have some of the most stringent gun control laws in the US and they don't do much but put pressure on business owners and make shooting as a sport and pastime even more expensive. Oh remember those schools I was talking about, one is a high school and about 2 years ago four men took it over because they brought weapons into the school. I say this to demonstrate a point, criminals don't care about laws, gun control does not hurt them. I am one of the men in the picture above. The facts per the FBI, 70% of violent crime is outside the home. The states with the strongest gun control laws, have the worse crime rate. Criminals DO NOT CARE about gun control laws. Their break laws thats their "job". You should have no fear of an open carrier. They are law abiding citizens. Open carry of a firearm has never, lets repeat that, HAS NEVER been illegal in CA. Only sense the above posted walk into the State Capitol has loaded open carry been banned in most of CA. Concealed Carry is not an option for most in CA. In CA, we have a 'may issue' concealed gun permit. It is left to the judgement of your local chief of police, or local county sheriff. Most city chiefs pass it on the the county. In the bay area, you need to prove that you need it. Self Protection is not a good enough reason, in the eyes of the locals. I believe every person who is able to buy a gun legally, should be able to get a CCW. It works in 39 other states. Crime has gone down in every state that has 'Shall Issue" and or Loaded Open Carry. It has been proven, if the bad guy does not know who has a gun on them, then crime will decrease. Why would the bad guy take the change? They don't. The Open Carriers come from all walks of life.We have ex-law emforcement, ex-military, doctors, lawyers, bussness men and women. It is about our safety, and that of our families. Crime has gotten out of control in CA. Every city and county is cutting back on police services. The Police can not protect you. They do not have a duty to protect you. It is every persons duty to protect themselves. No one wantsto have to use a gun, or for that mater any means to hurt another. But, we have that right. We can use any force needed to stop someone from doing us harm. Guns are not the problem. guns are just a tool. It is the person that kills, rapes, and robs you. Not the gun. A gun in the hands of a law abiding person is not going to hurt you. We respect law enforcement, and work with them as much as we can when we set up our events. To get to know us, feel free to come on out to a meetup. We may be having one in your area soon. If not, contact us. ask us. WE will be open and honest with our answers. We respect others views, and rights. I am one of the people in the above picture. I carry because I want to be able to go home at the end of the day. We stand behind the fact that armed, common, law-abiding citizens are responsible, well-trained, and actively reduce the violent crime rate in society. We also seek to dispel the common myths and misconceptions that the non-gun-owning public may hold in regards to their concerns on the subject of a lawfully armed citizenry. Despite the references to "irony" made by the author, he makes one comment that needs particular attention. The sentence he begins with "What frightens me..." and then proceeds to describe rhetoric and propoganda that he does not like. Which as an American, he has every right and freedom to speak his mind. I dont deny him that right, it's #1 on the Bill of Rights. However I do take issue with his treatment of all Americans #2 right, guaranteed in the same Bill of Rights. Although many people can be "Frightened" by many things (guns, words, ideas, religions, races, false imprisonment) it doesnt give anyone the ability to deny rights to others. Contrary to popular belief "feeling safe" is not a guaranteed right. Now I dont want to go into all the various arguments and permeatations of the right to carry, that would be an immense disertation, and would of course rehash the same arguments that are made over and over again. But the core issue I keep hearing is the mere sight of a firearm is so obscene and SCARY that it will send the general public running for their lives. Which is absolutley not true. And it is no wonder, the past 30+ years of Biased media and Hollywood portrayal scaring everyone, so much so that an entire generation of americans have been scared right out of their Constitutionally guaranteed right. And for those of us who have had to deal with crime, and the fact that law enforcement is not effective, the reality of any life threatening stiuation really boils down to just you trying to survive. If you cant escape that situation then you are left with fight for your life or just die. It may take a whole 30+ years and another generation of Americans to dispel the false notion that law abiding citizens carrying a firearm are more of a threat than the drug using violent felon concealing an illegally acquired weapon looking for a target of opportunity. Just as the author is frightened by the Open Carry Movement's "explicit links to the populist right in America, both its current incarnation in the Tea Parties and the older versions like the John Birch Society", I am just as frightened by this blogger's lack of knowledge regarding the facts regarding an armed, law-abiding general populace. What this writer characterizes as "theories of crime prevention" is actually published by our own federal government as fact. According to the US Department of Justice in a study conducted by the National Institute of Justice during the anti-gun, Clinton Administration years, there are at least 1.5 million defensive gun uses that occur in the US annually. Averaging out this 1.5 million DGUs/year figure by the number of days in the year nets us an astounding 4,109 lawful defensive gun uses by common, law-abiding citizens every single day in this country. Don't believe me? Allow me to provide you with the study. Look on page 9 for this 1.5 million DGUs/year figure. With this fact being published by our own federal government, one might be inclined to think whether or not it might be a distinct possibility that one of those 4,109 instances of lawful defensive gun use that happen every single day in this country could possibly be a reality that we could face ourselves on a day-to-day basis. The information you are looking for can be found in figures 5 and 6. As you can clearly see for yourself, the instances where a common, law-abiding citizen may have just cause to defend him/herself with a firearm are many. The Open Carry Movement in California is about actively exercising the only available means to most common, law-abiding citizens in the Golden State to lawfully bear arms in the event that they are ever faced with violent criminals--a reality that, according to our own federal government, is an all-too-common occurence in the society that we live in today. From an outsider's point of view, open carry movement, and other arms movements are just a part of USA's culture of violence. Violent crime is also part of such culture. All cultures have positive and negative aspects or components. For instance, some cultures are male chauvinsts, others are authoritrian, others are corrupt. As the last comment mentions, USA's violent culture will need one or more generations in order to be significantly reduced. This violence also happens outside your country, like Vietnam, Nicaragua, Irak and now Afganistan, where innocent casualties are justified by the sought ends (ask your self: who's ends?). A lot needs to change in you great, but violent, country and culture, but it will take time, and I think that everyone should start at home with our children, protecting from violent videogames, violent films and TV, and other polluting media, and from becoming used to real guns, the main "tool" of violence. Become an example for Amerian children to follow, do it for your children, and for Afgan children as well. The "culture of violence" that is implied in the last comment that supposedly exists in the US in relation to other countries is actually a myth. This mythology has been promoted by the gun control lobby around the world and has too often been accepted as fact by too many around the world. When compared to other Western societies around the world, the United States actually has a much lower violent crime rate because of the fact that the general populace is well armed. Allow me to illustrate. The published violent crime rates (2007), all from their respectively linked government sources below, clearly demonstrate the truth about this issue. In fact, since the institution of that wholesale handgun ban in England in 1997, the violent crime rate in that country has become so unacceptable that the government has resorted to lying about it and has been caught by their mainstream media for under reporting it by as much as 60%. If you don't believe me, feel free to click on the link here and see for yourself. Keep in mind that, as astounding as that violent crime rate figure in the UK is, it is actually under reported by as much as 60%. I hope this sheds some light on the subject of the "culture of violence" that exists in the US as compared to other Western societies around the world. The Mauser-Kates Study, "Would Banning Firearms Reduce Murder and Suicide? A Review of International Evidence", was academically peer reviewed and then published on Volume 30, Number 2 of the Harvard Journal of Law & Public Policy (pp. 649-694). Hopefully, the evidence that I have provided here will help those who are on the fence about the gun rights issue understand the truth surrounding an armed general populace. As you can clearly see for yourself, I have provided international, government-sourced information and peer-reviewed, academic research studies along with supporting documentation from mainstream media sources. The sources from the gun control lobby are not. you say, "Do it for your children". That is who we are doing it for. We are standing up for our Rights, as U.S. Citizens, so our kids will still have some Rights left when they grow up. I carry today, and am in a fight to protect the U.S. Constitution, and the Bill of Rights so we do not end up in a socialist state. Open Carry has always been legal in CA sense it became a state, No current law officer has came up with a case that open carry of an unloaded gun by a law abiding person has EVER been charged with a violent crime. I appreciate your inputs, though I have little patience for the bulk of your response. As a resident of several international cities, London being one of them, your insight and research on guns and violence in cities outside of America is so incredibly ill informed that I'm not even going to get into a counter argument regarding the countries that you mentioned. What is different is as simple as the way in which people walk down the street. America is an isolated place where social interactions between complete strangers is frowned upon, and in many cases is seen as an introduction to a potentially threatening situation. When a person walks down the street in Toronto, or gets off of the bus in London, I assure you, this obsessive fear of the 'other' does not exist in any relative form. A 'culture of violence' has little to do with carrying weapons so much as a 'culture of fear'; a perceived risk of intrusion or perceived risk of attack. As a frequenter of American cities over the past 20 years, I can calmly state that this culture of fear exists nowhere else in the Western world as it exists in America. Through my own work, my time in many conflicted regions of the Global South has been full of interactions with far more sensible citizens at risk of much greater loss than those situated anywhere in America. Perhaps this is simply an "us" verses "them" debate, which I care little to enter into. What I will say is that many citizens of other western cultures, more so urban cultures, which are located outside of the US have absolutely no understanding of the "who" you are protecting yourself from. Who are you afraid of? Why are you afraid of them? If this is what your appreciation of "freedom" gains you (a society that is so scared of its own neighbours that it needs to carry guns in order to function), then I for one can confidently state that my obtrusive and 'socialistic' government delivers far better results than your "free" society does for my children. My country operates so well, that I don't even NEED your Bill of Rights. Your 'constitutional right' to protect yourself, much like the notion of "Justice" in every other society, is only valued when the vast majority of citizens fail to adhere to laws and social values that are considered to be of "good value". Since every society functions on the understanding that humans are of good value (this is how loans are given, stores operate, laws are written, etc. ), there is no reason to introduce weapons as a standard form of societal functioning. Carrying weapons does nothing more than escalate a situation. An escalation of force, which can be seen here as a localized arms race (He has a gun, so I need a gun...) will do nothing but exacerbate the issue at hand. Anyone with a clear conscience and some basic knowledge of peace and conflict studies will attest to this. What has been considered an incredibly complex debate on the American platform, is so ridiculously simple to everyone else in the world. I would request that members and supporters of Open Carry take some time to travel to Toronto, London, Mumbai, Tokyo, Bangkok, Berlin, or Cairo, and walk down the street with your beloved "unloaded" firearm attached to your waist. I assure you that within several minutes, you will see how incredibly demented, sickening and simply sad your "great' and "free" society is perceived by the rest of the world. To be honest, no one else cares that its your constitutional right. On the other hand, do us all a favour and stay home to continue your obsession with shooting each other in America. Our international collective patience for your outrageous social practices has long evaporated. After some thought I think it is only fair that I illustrate my rationality for criticizing your comparison of violent crime rates. In any argumentative forum, no less a highly academic one here on polis, I would suggest you find peer reviewed, or at least contextual figures. Case in point, the calculation of the Violent Crime rate differs from one place to another, making it an incredibly irregular statistic to compare countries or even cities by. Violent crime in the US, for example, includes a calculation of aggravated assault charges. In Canada, the violent crime rate includes all categories of assault, including Assault level 1 (assault not using a weapon and not resulting in serious bodily harm). A similar calculation exists in the United Kingdom. The numbers associated with these other categories completely skew the chart when compared with the US. The reason that this tactic was adopted in Canada was to further the initiatives that were contributing to the already decreasing rates of crime (i.e. officials did not want a decreasing crime rate to create opposition to anti-crime-related initiatives). I would add that although violent crime rates are not comparable, some numbers can serve as appropriate comparative indicators. Some numbers are in fact absolute, like homicide. "In general, homicide is the most reliable police-reported offense in Canada and the United States. It is the least likely to suffer from under-reporting and has one of the highest arrest and clearance rates" - taken from the study noted above. Just as a general point, using your sources, the homicide rate in the US per 100,000 is nearly 300% higher than that of Canada. Similar trends are seen in weapons related offenses, which is more related to the article that we are commenting on. In any event, looking at rates of crime by category completely reconfigures the appropriateness of your rationale. Moreover, your tactic of "comparing the US with a country that is as similiar to America in culture and societal norms as possible, such as, for instance, England (UK)", fails miserably. Firstly, England is not a country, the United Kingdom is. Secondly, the two countries differ entirely in social configuration, politics, approaches to crime prevention, histories of violence (need I mention The Troubles), and general notions of the individual with regards to the state. The UK is one of the most highly policed and highly monitored (through CCTV) countries in the world. There is little regard for "freedom" when compared to the American ideal. Canada is also a completely different society, focused on tolerance and the greater good, with a highly socialized approach to welfare and health. What I tried to highlight in the previous comment (before getting angry) is that these basic themes, the social and political elements of a country, are the greatest contributors to improvements in crime and social well-being. Banging on the 'constitutional rights' drum in the name of freedom will do little to improve the social problems in America. It is an isolated nation with distinct ideals, none of which translate very well to other Western cultures.